Easy to access, easily reversible, progestogen only. 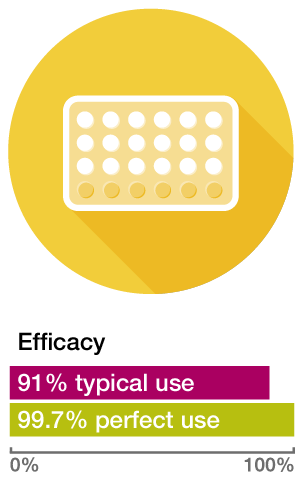 The Mini Pill is a different contraceptive method to The Pill. While The Pill uses two hormones to work, the Mini Pill only contains progestogen, and has no oestrogen in it. This means that it doesn’t affect your ovulation cycle, and instead prevents pregnancy by thickening the cervical mucous which stops sperm from getting through into your uterus. Tip: The Mini Pill has to be taken at the same time every day, so if you’re the forgetful type, it’s a good idea to set an alarm on your phone. How do I use the Mini-Pill? Step 1. The progestogen only pill comes in a variety of different forms all of which require a script. Before considering this method you will need to make an appointment with your doctor to discuss which type of the Mini-Pill is right for you. Step 2. Once you have a script for the Mini Pill, make sure that you discuss with your doctor or Pharmacist the correct way to take what you’ve been prescribed. Step 3. The most important thing to remember with the Mini-Pill is that you need to take it at the same time, every day. Make sure you leave it in a place where you will see it at the same time in your daily routine. If necessary set an alert or alarm to go off at the same time each day (and don’t forget to take it with you if you travel).